I recently noted yet another "error" made by Nina Teicholz, author of The Big Fat Surprise. This time it was in an editorial in the New York Times, unsurprisingly blasting the report of the Dietary Guidelines Advisory Committee. CSPI sent all these exact points to the NYT fact checking department, and they were all rejected. Save one: it wasn't "cheese" that declined since 1970 but rather "full-fat dairy." 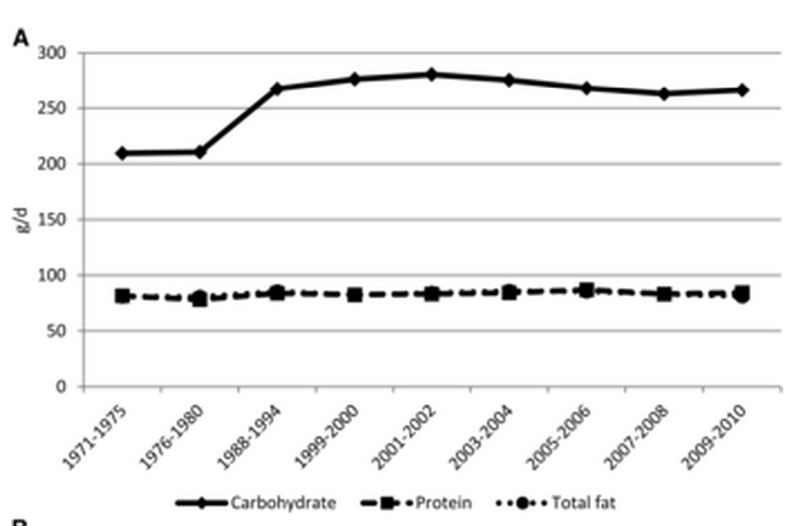 Which makes no difference to the overall argument: we reduced fat and protein and replaced them with carbs. Well well, seriously, this woman needs a radical double shovelectomy -- one to remove the shovel she uses pile on the distorted facts, and the other for the shovel she keeps reaching for to dig her lack-of-credibility hole ever the deeper. Yep, putting the Incestral in IHC, she cites Hite & Economists and their "new" article on NHANES data that I just discussed HERE. Most comprehensive analysis to date? LOL. But even their findings do not support Teicholz's assertion. From my post, a plot adapted from the paper (ignore 1965, it's not NHANES data). We have NOT cut fat intake by 25%. We just haven't. That is a deliberate distortion at this point and it doesn't fly. Not only that, but if Teicholz is supposed to be anything it's a journalist, and good journalists are careful in their wording so as not to alter the meaning of information. Cutting fat intake by 25% implies that if we were eating the equivalent of a stick of butter per day in 1965, now we are only eating three-quarters of a stick. This is not the case. The only case for absolute reduction in fat relies on a questionable data point that doesn't fit with -- as in it's from a different source -- the NHANES data. 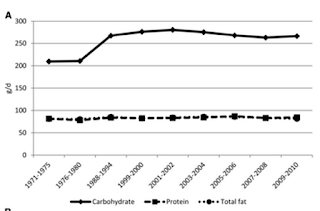 We didn't reduce fat and protein, we just added more carbs than anything else (according to NHANES anyway). Oh .... and this information has been available for a long time, and at the very least one would think Teicholz was familiar with the 2013 Trends in energy intake among adults in the United States: findings from NHANES paper. It doesn't get much more obvious than this! I had posted this over on Marion Nestle's blog, and Teicholz responded. Again, here, the wording is important. The committee doesn't even have a list of recommended foods per se anyway. I'm not sure why the committee put the part about lean meats in a footnote, but it's in the report, so you can't get much more clear than that. I realize it's a nuance of sorts, but there is a big difference between the DGAC writing in a summary point something to the effect that lean meat should no longer be advised as part of a healthy diet, which is what Teicholz implies, and what they actually wrote. 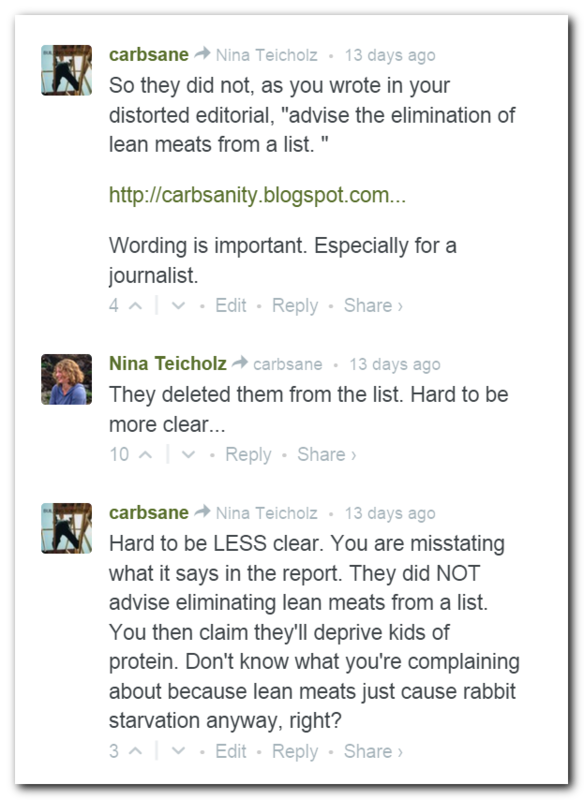 7) My piece says that "lean meat" was eliminated from the 'list of healthy foods.' This is a list that has traditionally existed in the DGAs and comprises the foods that Americans are told to eat more of to be healthy--and this list is significant in that programmatic advice flows from it, eg., the School Lunch menus. This list used to include "lean meat" and now does not. Here is the actual language from the 2010 DGAs: they say that Americans should eat a diet that "emphasizes vegetables, cooked dry beans and peas, fruits, whole grains, nuts and seeds. In addition, increase the intake of seafood and fat-free and low-fat milk and milk products and consume only moderate amounts of lean meats, poultry, and eggs." The 2015 DGA committee report says that a healthy diet should be "higher in vegetables, fruits, whole grains, low- or non-fat dairy, seafood, legumes, and nuts, moderate in alcohol; lower in red and processed meat..."
See? no "lean meat." There is no encouragement to eat meat of any kind--only to lower it. (In fact, there was a great deal of media coverage after the DGA committee showed a slide at a December meeting revealing that it planned to eliminate "lean meat," which shows the significance of this committee decision). Possibly in response to that media coverage, the committee inserted a footnote stating that "lean meat" could be part of a healthy dietary pattern such as the US diet (whatever that is) and the Mediterranean Diet pattern (although the Med Diet has never included "lean meat"--it includes only regular meat; moreover the clinical trial on which the Med-diet recommendation is based actually contained more meat than the control group). I don't recall this media coverage, but whatever. Perhaps if Teicholz didn't dismiss well conducted 2 year RCTs on a Mediterranean Diet such as Esposito (blogged on here) she might gain some credibility. What Kind of Meat is there in a Mediterranean Diet? And I was then reminded of how Teicholz began her book. I remember the day I stopped worrying about eating fat. It was long before I started poring over thousands of scientific studies and conducting hundreds of interviews to write this book. 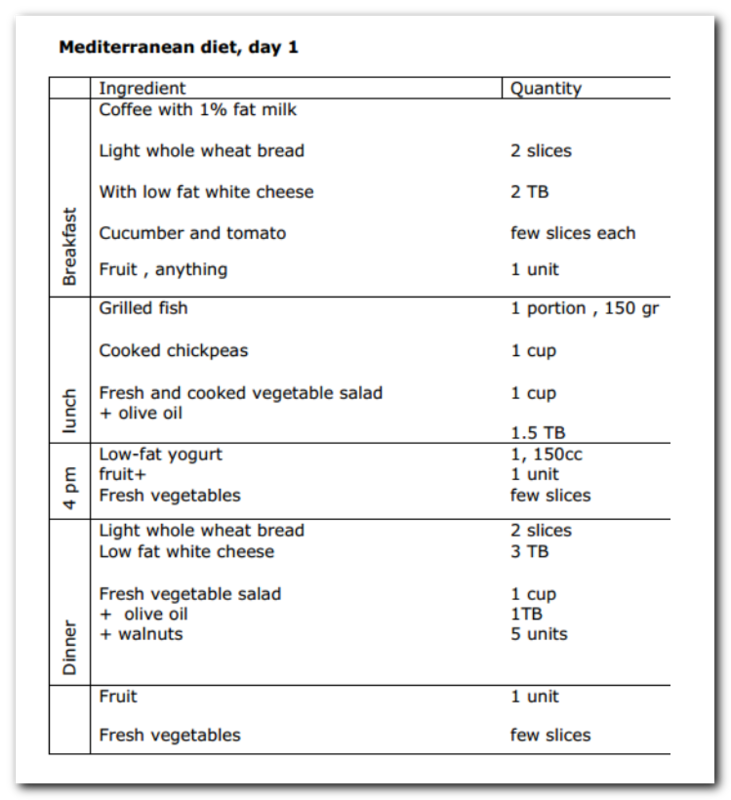 Like most Americans, I was following the low-fat advice set forth by the US Department of Agriculture (USDA) in its food pyramid, and when the Mediterranean diet was introduced in the 1990s, I added olive oil and extra servings of fish while cutting back further on red meat. So I'm not sure what "normal meat" vs. "lean meat" means to her or what Mediterranean diet she's talking about. It's fair to say that there is some confusion about the Mediterranean diet, but there's really no confusion as to what constitutes a vegetarian diet -- no beef, pork, chicken, fish, clam or even lamb (Big Fat Greek Wedding joke). She seems to be confused on the definition of "meat" in general. In any case, this footnote is different than the list. The statement in my op-ed was about the list, and this remains accurate. Now she's really parsing. Instead of just revising her language, she digs in her heels. This is becoming a habit. It's funny I remember not being a big fan of the CSPI, but I can't remember why. It wasn't the trans fat thing, but I kind of figured that Teicholz would go for the low blow against the CSPI for once promoting trans fats. I think she claims that she started as a crusader against trans fat before blowing the lid on the labyrinthine conspiracy against fat. But did you notice that magazine article she links to in the NYT OP-ED suggested that the notion that trans fat is harmful was not confirmed by rigorous testing? On the other hand, I think that she may have a few good points about lack of public awareness and the awkwardness to retreating from the low-fat recommendation (but it was 2000 when the language first retreated from low fat to moderate fat not 2010 as she says). At least her opinions were better explained in the comment than in the OP-ED. Except that thing about meat consumption puzzles me. Has anyone ever figured out how she thinks that sources show meat consumption decreased? Is it by percentage of the diet like the fat/carbs claim? Maybe I should become a fan ;-) I was trying to find a list of issues they'd been involved with and they got the Airborne stuff nixed too! The timing with Teicholz is suspicious because she started writing about transfats. Yes, that op-ed is hilarious in context with her current credo. Also she was there, then disappeared. Did she not get the book done in time before everyone was already on board and the transfat thing had blown over? Ooh! Just caught her in another flub. 2 retreat to a disprovable position. 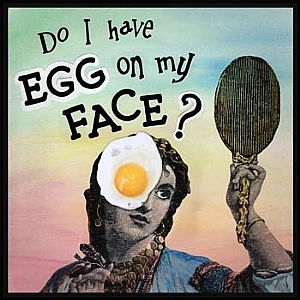 Nina Teicholz wrote, "Since the very first nutritional guidelines to restrict saturated fat and cholesterol were released by the American Heart Association in 1961, Americans have been the subjects of a vast, uncontrolled diet experiment with disastrous consequences." Michael Jacobson responded, "... we are now faced with an obesity epidemic and the ensuing rise in diabetes rates. But where's the evidence that diet advice is to blame?" What Teicholz failed to mention is that the 1961 American Heart Association advisory recommended replacing saturated fats with polyunsaturated oils. That advice persists. But now it says, "Swapping saturated fat and carbohydrates for linoleic acid ... lowers risk of coronary heart disease..." Google - "Linoleic Acid Harvard"
The peculiar thing about all this arguing about dietary advice and percentages of carbohydrate and fat intake is lack of interest in the fatty acid profile of the food supply. Linoleic acid should be the molecule of concern, not the three chain lengths of saturated fat that affect cholesterol. Exploring linoleic acid research is like wandering about in a dark forest that nearly everyone else seems reluctant to enter. But that's where the evidence needed to discern what is wrong with the food supply lies. Take a peak into the forest. Google - "Linoeic acid overwhelming"
Disclaimer - I am not responsible for the article title. I would have characterized the evidence against linoleic acid as disturbing or convincing. Overwhelming evidence would have forced the 2015 dietary guidelines advisory committee to reverse themselves on this particular issue. She really says chicken is not meat? Weird. The trade websie, Drovers Cattle Network loves her, but I have trouble with the industry conspiracy angle because it's often used to discredit people with out good reason. The other day, I was accused of being duped by the sugar industry for not whole heartedly believing Dr. Lustig. I think her husband also writes for major media too. I figure its to do with the false balance where these publications try to portray both sides like have anti-vaccinators on. But really they are trying to capitalize on sensational man bites dog stories. "Butter is part of a healthy diet." I thought maybe her book timing had to do with the Chowdhury meta-analysis.